Supernatural 7x02 "Hello Cruel World"
Can I just say I am liking this season about 100 times more than last season already? Not that I didn't like last season, but it definitely did not make me go "What!" and flail in the second episode quite like this. Pretty good for a show in its seventh season, I must say. So just what happened to garner such visceral reactions? Why I'm getting there, calm down! We open right back where we left off last week, with the Leviathan taking over Castiel's body. Is Leviathan both the singular and plural way to say that? Grammar police? Cas' body isn't doing so well with the transition, so it decides not to expend the energy to kill Dean and Bobby at this time, and instead goes out into the nearby handy reservoir of drinking water to replenish its many selves. 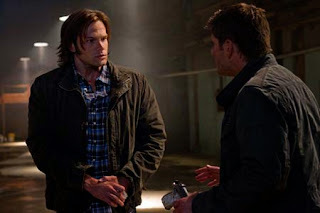 By this time, Dean and Bobby have found Sam, who is still seeing Lucifer, but doesn't embellish on it quite yet. Anyway, LeviaCas walks out into the reservoir and goes black-inky-sploosh, leaving behind nothing but his dear beat up trench coat, which Dean saves from the watery depths. Aw. Back at the ranch, aka Singer Salvage, Dean awakens Sam from a 12-hour snoozefest and demands he tell him how he's actually doing. And this is a big step in the right direction for their relationship, because Sam actually tells him the truth rather than try to hide it. He's actually very grown up about the whole thing, despite that nagging Lucifer hallucination constantly nagging at him off to the side. Bobby wonders how all of this is weighing on Dean, what with Cas likely being dead and now Sam losing his marbles, and Dean classically tells him to stick a fork in it. Oh Dean, like you'd say anything else. But there's not a lot of time for them to dwell on Sam's melon deterioration, because these Leviathan have already infiltrated some new people in Kansas and are, naturally, killing a bunch of people after taking their forms and memories. Dean goes to investigate said problem while Bobby continues researching, I guess, and Sam gets to sit around and argue with Lucifer and take apart his guns. It sounds like I'm making fun of the scenes between Sam and Lucifer, but I'm not. I love them. The way he's slowly starting to wonder what's real. Poor Sammy. Meanwhile, over at Sioux Falls Hospital, Sheriff Jody Mills has recently had an appendectomy. She has an annoying bedside lady complaining constantly to her, but hey, that lady is not long for this world, because it turns out the Leviathan are also in Sioux Falls, and have taken over her doctor. The doctorviathan takes out annoying lady, only Jody sees it all. Having dealt with a zombie situation with Bobby in the past, she calls him up to come rescue her before she's the thing's next meal. While Bobby goes to his damsel in distress, Sam is left to fend for himself. Not for too long, though, because Dean appears, having supposedly followed his Leviathan from Kansas back to South Dakota. You keeping track? They're all over the place, apparently. Anyway! Dean says he needs Sam as backup to take on these things, so they head off to... an office building? But hey, we know that they're at the hospital. And hey also! Dean is being a jerk to Sam! Well duh, it's not really Dean! It's HalluciDean (a great name because it also incorporates Luci-fer! Genius!). Only Sam has not figured this out yet, not until HalluciDean takes him into the place and reveals it's actually some sort of warehouse, and turns back into Lucifer. At this point, Lucifer starts taunting Sam more, to the point where Sam tries to shoot him with one of those guns he was cleaning earlier. Lucifer points out that this is pointless, and the only way to really make him go away is to turn the gun on himself. Meanwhile, Dean has actually returned back to Bobby's, only to find that Sam isn't there. Luckily, thinking something like this might happen earlier on, he turned the GPS on in Sam's phone. This is a thing you can do? News to me. Nonetheless, he tracks the GPS to the warehouse and finds Sam, who really doesn't know what to believe anymore. Dean manages to get through to him by pressing on that hand wound he still has going on, telling him that the pain here in the real world is different than the pain down there. And each time that the wound gets pressed, Lucifer kind of spazzes out of corporeal-ness. So, hey, this is kinda working, right? Sam keeps pressing on that sucker and listening to Dean telling him he needs to know that this is real and go from there, and Lucifer seems to go out of existence for good. For good? Psha. While all of that is happening, Bobby has gone to investigate what happened to that annoying hospital lady from earlier. He finds her body in the morgue, all gross and stuff. And that's when Leviathandoctor shows up. Bobby tries to shoot him with some silver, but it doesn't do much good. He hightails it and calls up the boys to meet him back at his place. But when Sam and Dean get there - the place is torched!!! Omg! 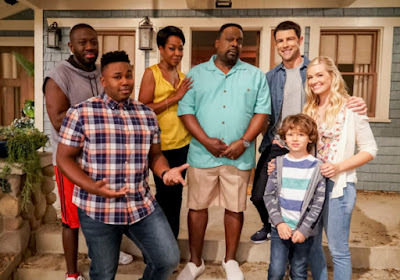 No more Bobby's house?! That was sort of like their home! On top of which, there is no sign of Bobby either, only some Leviathan there to kill the Winchesters. They fight for a bit, but it's not much of a fight. Dean gets his leg broken, and Sam gets hit in the head with a golf club and goes down for the count. Luckily they managed to smash the Leviathan beneath a car so they have some time. Dean manages to call 911. Wow! He called 911?! This must mean it's for real serious. Well, it is. Because he can't really walk, and Sam is still out. As they're being hauled away in the ambulance, Sam sees Lucifer again. Uh oh, he's not gone after all! Sam starts seizing, and things are only made worse when Dean hears the EMT say they're heading to none other than Sioux Falls Hospital. But that's where the Leviathan are! Oh no! We can't go there, Dean tries to get the EMT to see. But Mr. EMT is like sure buddy, let's take a nap, and gives him some drugs. Uh oh. And then... the episode ends! AAH! - Did you catch the ad for Biggerson's pie bar? Just like a salad bar, but with pie! Damn, I'd like to see one of those in real life. - Someone should keep a tally of how many freaky children-who-act-too-old this show has had now. And somehow it still never fails to be creepy. - Just when I was thinking to myself, "Why wouldn't the hallucinations make him see Dean?" that's exactly what happened! Ha, I know TV too well. - Dean's call to Bobby to let him know how he's really feeling. Which is that, if Bobby is dead, he'll take Sam and drive themselves off a cliff. Aww. - Sam looked so freaked out in the warehouse. I thought Jared was doing a great job at that. - Isn't there some saying that you're only going crazy if you don't think you're going crazy? Keep holding on, Sam! You can do it! Okay. He's a fictional character, get over it. - Um, next week? Looks awesome. Pretty sure it's also the one that Jensen directed too. HalluciDean: You could be seeing all kinds of crap, you don't know. Sam: How is this helping? First off Ben Edlund is the more superior writer I enjoyed this more than last weeks episode. Ben writes crazy better. I agree with you on Jared's performance, too bad this wasn't a CBS or any other major network show we could see major award nominations. Mark Pelligrino I'm glad he's staying put his Lucifer is more in league with Lucifer's torment of Jesus in the New Testament, which always makes for a sinister character even if it is a hullucination. Bobby's dissapearance well no body no death. He'll show up next week, I guarantee it. Can't help but point this out, the Leviathan(s) are supposed to be so powerful and dangerous that even God feared them and had to invent a safe place to put them, they can shapeshift and grow their hosts (which is mind boggling but still awesome) yet they cannot bust out of a small child because she's too small and really cramping their style. This has to be a FCC "no demons can rip children apart on screen" rule, but it really questions their might. The miracle grow really doesnt provide a complete answer. Also why are they liquid in form? Being a liquid or Black oil and splashing inside a person's mouth to possess them, how is this any different from demon? Sera herself said she wanted to move past demons and angels this year, and we are most likely never to see them at all, so she creates a creature that is very similar to them. Astute analysis as always. I do enjoy this season more already too. I'm glad they didn't drag out Sam's "It's real, it's not real" thing any longer, though I think it will be interesting to see Satan around as a figment of Sam's imagination. So, I'm thinking the opener is more about the Leviathan than the angels now. Looked like the angel wing blots, but now it definitely looks more like the inky black mess the Levis make. The MOUTHS on those things! Yikes! Do you think the Levis are the season long arc big bad, and they might have a few small bads tossed in while they try to beat 'em? @Darren - My guess as to why they made the Leviathan enter people that way is because that means they can be virtually anywhere through the water system, and they are associated with water as sort of sea demons to the general public. I just wish the evil things weren't always having to take over people. Probably budgetary reasons, but we hardly ever see real monsters. Just glimpses of their teeth this week. @Laura - Yes I definitely think that the opener is more about the Leviathan as well. As for whether the Leviathan are the season long big bad, I can see them being maybe the big bad for most of the season, then whoever is their boss becoming the bigger threat, as it's currently unclear whether the boss is another Leviathan or someone else. Sort of like Eve last year, made to seem like the big bad, but wasn't really so.